Nancy looked out at the huge shadow blotting out the golden light of sunset in the doorway, and felt cold with foreboding. What was it? She had to act without Joe, right this minute. Beside her, the little robot was now waving her arms up and down, beeping urgently. Nancy caught one of the arms, and into its hand she put the glowing red robotic heart that she had rescued from Boppo’s pocket. Roberta’s beeps became a wild medley of joyful chirps, and she opened a little square door in her shiny metal chest and popped the heart inside. Then she began to purr. It was a sound rather like an electric fan. But from outside the gingerbread house, Nancy could hear a deeper purring, more like a diesel motor, accompanied by a kind of muted clapping. She stood stock still. Was it possible? These had been the happiest sounds of her life ever since she was a baby. She began to smile, feeling her own heart pounding with excitement. She ran through the door and looked upward, beaming. And there stood the twins’ beloved foster mother from the Sick and Tired Circus, all seven thousand pounds of her. It was Hathi the elephant, rumbling and flapping her ears with pleasure as she nosed at Joe’s sleeping form with the tip of her trunk. The trunk rose into the air and descended gently on Nancy’s face in a happy greeting; it was like being kissed by the hose of a vacuum cleaner. Nancy cried tears of mingled joy and guilt and relief. After that life-changing moment at the Elephant Clown Party, when they had been forced to leave without a word of farewell, she had despaired of ever seeing Hathi again. “Never mind,” said Hathi. “Your secret circus support system kept me informed.” She raised her trunk again, dipped it into a sturdy box strapped to her back, and presented Nancy with a large, perfectly ripe banana. “You look hungry, my darling,” she said. “Oh thank you!” Nancy’s tears gave way to famished gratitude. Joe stirred, and opened his eyes. 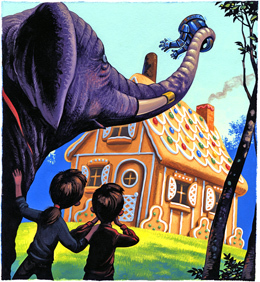 “Hathi!” he cried, and he leapt to his feet. Love can work wonders; it beats drugged gingerbread every time. Nancy stroked Hathi’s trunk. “You came after us!” she said through a mouthful of banana. 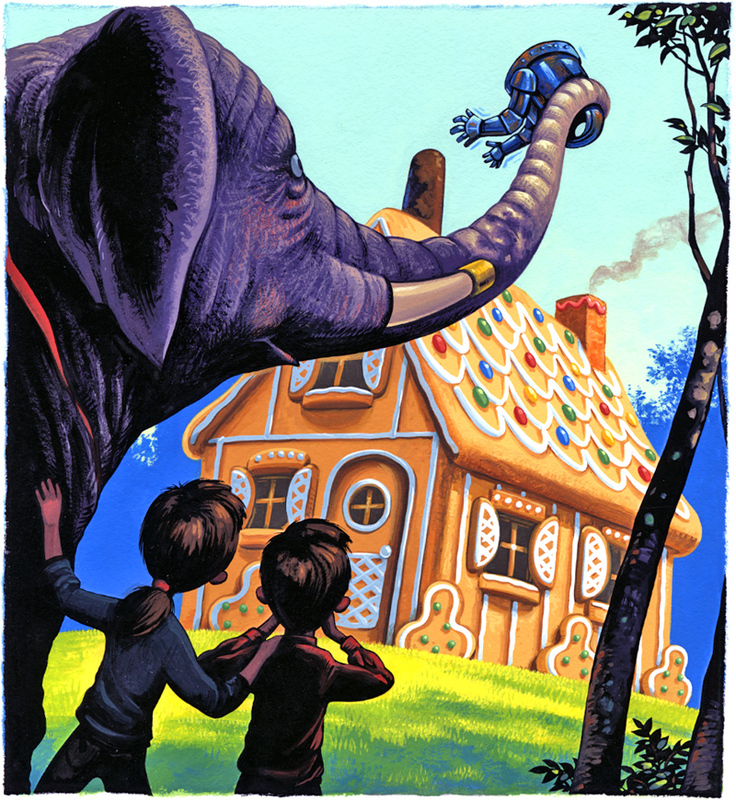 Her long trunk swung to and fro, and paused at the doorway of the gingerbread house. “I smell BOPPO!” said Hathi in a terrible voice. “Is he in there?” said Joe sleepily to Nancy. She dashed into the house, with Joe stumbling after her. The tip of Hathi’s trunk hovered in the doorway. There was the little robot, armed but legless, still purring – but she had her arms round the sleeping Boppo. Roberta clung more tightly. She purred more loudly. She turned to look at the contents of Boppo’s pockets, still scattered over the floor. Hathi’s trunk was already there, sensitive, groping. It picked up one of the red rubber noses and held it out to Nancy. Roberta stopped purring, and let go of Boppo. Nancy took the nose and shook it over her palm. Out fell a tiny piece of green metal patterned with a maze of gleaming lines. Roberta uttered some rapid, urgent chirps and waved her arms. “It looks very electronic,” said Nancy. “It must be her brain!” She dropped it into Roberta’s hand. On the floor, Boppo stirred. Boppo licked his very, very red lips. “More meatballs!” he said sleepily. Roberta’s little robotic arms moved like lightning. They broke off a piece of the gingerbread windowsill, crumbled it, and popped the morsels rapidly one by one into Boppo’s mouth. He chewed contentedly. “Mmmm,” he said. It was several seconds before his taste buds told him he wasn’t eating meatballs, and his eyes flickered in alarm – but it was too late. He was fast asleep again. “Hoist with his own petard,” said Roberta with satisfaction. “Out!” said Nancy. She paused, added politely, “Excuse me, Roberta,” and thrust the little robot into Hathi’s curling trunk, following it outside. 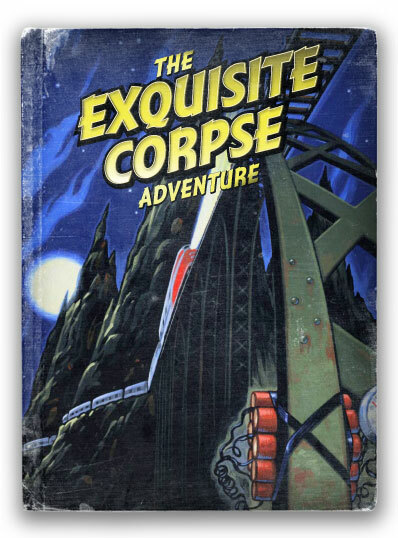 They saw her eager mechanical arms clutch the chimney-leg – and then saw it crumble. It wasn’t a robotic leg after all; it was just gingerbread, pretending. “Rats!” said Roberta, and disappeared, as Hathi’s trunk swung her over to the howdah (a fancy name for the box, which was indeed pretty fancy) on her back. Then the trunk came down again, tip curved, and with the skill of lifelong practice Nancy and Joe stepped aboard. They rose through the air just as they had at the circus: feet standing on the tip of Hathi’s trunk, hands against the trunk itself, for balance. It was their favorite form of travel in the world, ending with a small acrobatic leap into the howdah. The instant they were safely on her back, the great grey elephant went striding away through the trees. And Nancy, Joe, and Roberta found that they were not alone. Sitting on one of the padded, velvet-covered seats, next to Roberta, was an old lady in a black cloak, with frizzy white hair escaping round her hood like an ermine trim. It was Sybil Hunch, eating a banana. “We’re so glad to see you, Miss Hunch,” said Nancy, wondering whether this was true. She felt they had had enough misfortunes already without having more predicted. Joe reached for the bananas; even after the gingerbread he was still hungry. The howdah was swaying vigorously now as Hathi loped through the forest. The sun had set, and in the dying light they could see Sybil Hunch’s crystal ball in her lap, gleaming faintly. “Right in the middle of our birthday party,” Joe said. “The elephants and the clowns gave us a party every year – a competition, to see which of them could make us laugh the hardest. They’d only just begun.” He sniffed mournfully. “Well now,” said Sybil Hunch. “Let’s see if the past can throw any light on the future.” She tossed her banana peel overboard and gave her crystal ball a quick rub with the edge of her cloak. They peered over her shoulder as the ball filled with whirling mist, and they saw a flurry of images. First they saw their youthful father completing Roberta, his dimension-doorway-finder; then the evil, irascible, destructifying creatures snarling at their parents on the other side of a door. The mist swirled, and they saw the Sloppies fleeing back as the door swung closed. At the very last moment, one of the creatures dived out after them: a formless monster, pursued by a bright dancing light. Then they saw Roberta’s metal hand turn a key in the door’s lock. “What’s that light?” said Joe, peering. They saw Alistair Sloppy handing his small adorable babies to the circus ringmaster, together with a sealed envelope. The ringmaster was nodding his head seriously. An elephant was dimly visible in the background. Panning to another part of the circus, the crystal ball showed them the monster morphing into the body of Boppo the Clown. Joe hissed. So did Roberta. “HUSH!” said Nancy and Sybil Hunch together. The twins saw their parents desperately zipping in and out of time and place, hiding bits of Roberta as they went, so that nobody would be able to seize the little robot and open the dimension door. The bright light danced with them everywhere, like Tinkerbelle. Soon Roberta was only a torso and two running legs. Mist swirled again in the crystal ball and they saw two chubby toddlers playing with a cute black piglet, while an elephant’s trunk hovered protectively overhead. Into the picture whirled the time-travelling Sloppy parents and the dancing light. They saw the toddlers look up, open-mouthed. The light morphed into the piglet, which at once hopped onto its hind feet and began to dance. For a heart-stopping moment Nancy and Joe saw their fleeting mother reach yearningly toward their toddler selves. Then the ball went dark. The steady lurching rhythm of the howdah began to slow down. Hathi called over her shoulder, “Get ready! We’re here!” She lifted her head and trumpeted into the night, like the first chords of the Eroica. Ahead, they saw a blaze of light.